An exciting year for elite riding gets underway this weekend with some of the world’s biggest stars coming together for an action-packed three days in Leipzig. Ten of the top 20 riders in the Longines Jumping Rankings will be present in the German city, with leading talents also taking part in Driving and Vaulting. With big names from across the three disciplines competing, including leading German riders, organisers are hoping to improve on the total crowd of 71,000 that attended last January’s event. The culmination of the busy weekend – available live on FEI.TV as well as Facebook and YouTube - will be the Longines FEI World Cup™ Jumping competition on Sunday from 13:50 GMT, which is set to feature top 10-ranked riders including Harrie Smolders and Kevin Staut. Daniel Deusser, the 2014 Longines FEI World Cup™ champion, will lead a strong German contingent, along with the likes of Christian Ahlmann and Marcus Ehning, as he seeks to pick up vital points that will ensure his place in this year’s finals in Paris in April. The 37-year-old, currently fourth in the Western European League standings, is eager to start the year in style and give lead horse Cornet D'Amour – who helped him to success in Lyon four years ago and a bronze medal in Gothenburg in 2016 – a good run out following an injury suffered towards the end of 2017. “It’s the first big competition of the year, and so I feel good and ready to go,” Deusser told FEI.org. “I’m trying to get Cornet fit after his injury, so this is a good opportunity." As well as Cornet D'Amour, Deusser will also use Jack Daniels, Killer Queen VDM and Hidalgo VG, and he told FEI.org that he has altered his training routine in a bid to improve results at the start of 2018. Looking ahead to Sunday’s competition, he added: “Leipzig is a nice show from several points of view. The infrastructure is nice, and there are big crowds with the arena very full at the weekend. Daniel Deusser was a BMX champ when he was a kid! With more than 30 home riders taking part in the Jumping event, there will be plenty for German fans to cheer. Deusser believes the standard of German riders is high, but would like to see their strength backed by winning partnerships with their steeds. 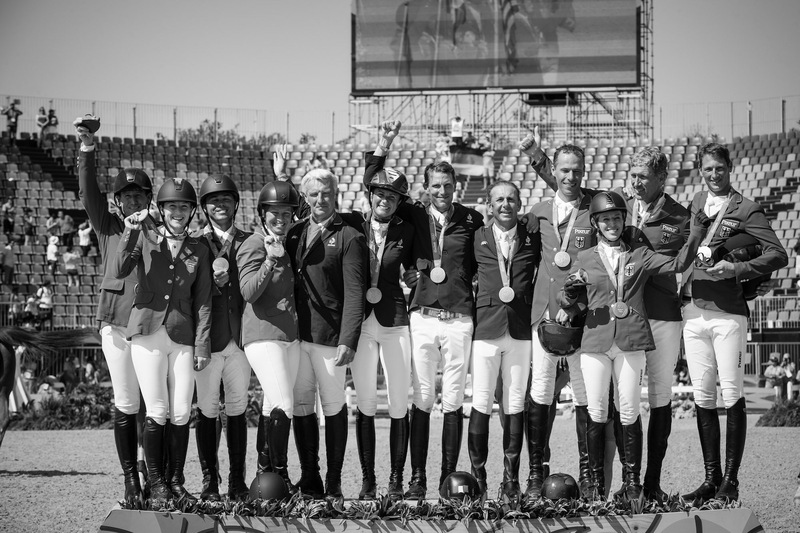 Who will be the next great German athlete and horse combinations? Hans-Dieter Dreher is another German taking part in Leipzig, and he is hoping to continue his fine start to 2018 after a strong performance in Basel last weekend. The 46-year-old is also convinced that German Jumping has a bright future and believes camaraderie is important. “Marcus Ehning is a very good friend of mine. If I have a problem he is always there to help me. I like his style and lightness to ride. As well as top-class Jumping, Leipzig will also welcome stars such as Boyd Exell, Koos de Ronde and Ijsbrand Chardon for Sunday afternoon’s FEI World Cup™ Driving competition. Many of the world’s top four-in-hand athletes will be finalising their preparations ahead of next month’s final in Bordeaux. High quality Vaulting is also assured with events taking place on both Friday and Saturday.